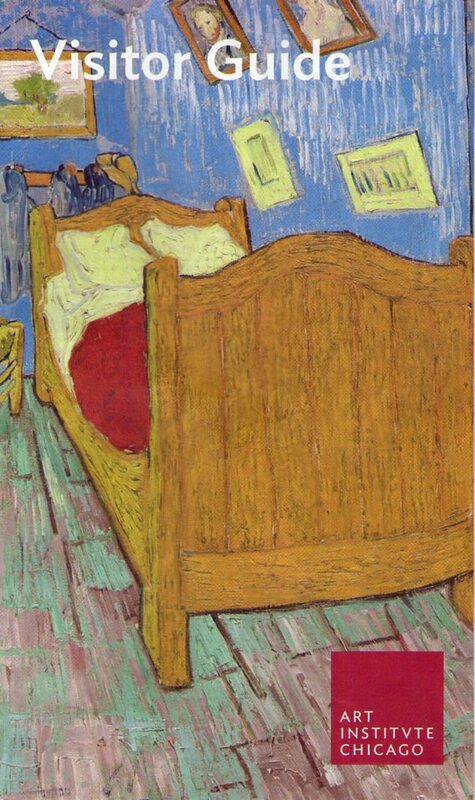 The Art of Accessibility visits Chicago’s famed Art Institute to be immersed in Vincent Van Gogh’s sketches and paintings (as well as other works of art). The Art Institute is breath-taking. While fairly sprawling, its collections are cohesive and comprehensive, but from a wheelchair accessibility point-of-view, the Institute seems to lack understanding of the spirit of “accessible”. 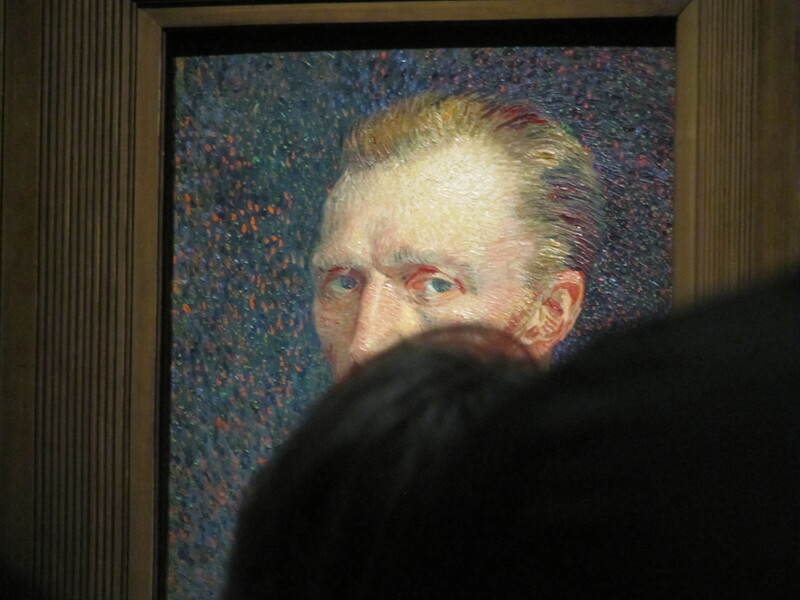 Entry into the Van Gogh exhibition was on the second level. As shown above, there were two ques to enter at the pillars, with the introductory verbiage on the left wall and enlargement details on the right. 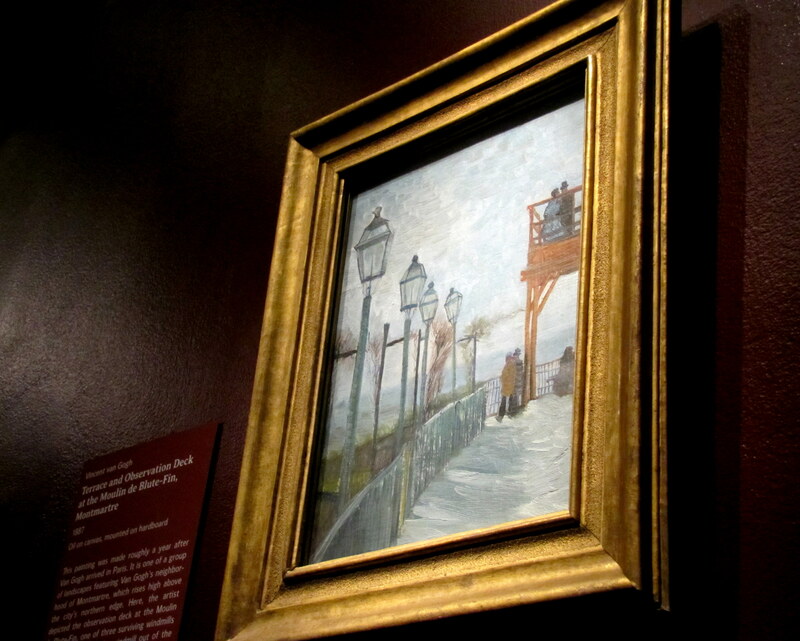 As you went in on the right, you begin to see Van Gogh’s journey to Arles. There was no set path to follow; consequently, there were often bottlenecks as people viewed and backed up to view again, various works. But works are art are often hung at “eye-level,” and eye level seems to mean the viewer should be roughly the same height as the curator who hung the exhibition. Even without the wheelchair, I’m 5’2″ tall, but in the chair, any work under glass such as this painting, had to be viewed at a severe angle to avoid glare. Then there was the opportunity to see works body blocked by those in front of you, which, I guess, is the price to be paid for infirmity. The worst part of the whole thing occurred in the gallery which housed the three bedroom paintings. There are subtle differences among them, and I had managed to work my way to the front of the crowd, with the intention to just slowly move along with the crowd to view them. However, a uniformed attendant (guard?) 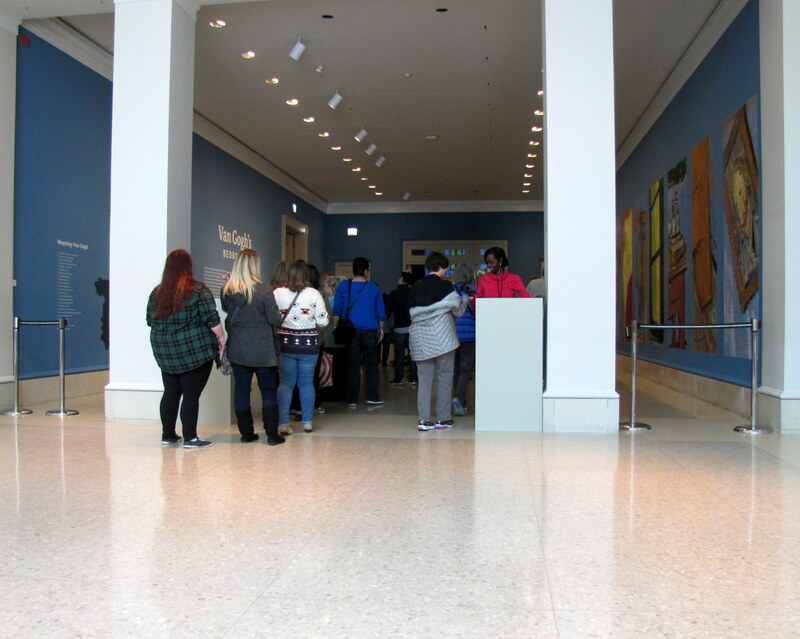 decided that I was actually trying to get out of the gallery and moved me even further in front of the crowd and moved them back so I had a clear path out of the gallery. He then continued to clear paths until I was out of the exhibition completely. I could have, should have, spoken up, but I think I was too dumbfounded to utter a protest. The exhibition, of course, emptied into a gift shop, but there was hardly room for me to see what was available (sorry, Liz! ), and the gift shop exit led you back to entry, on the side of the introduction, where everyone exiting decided they suddenly needed to read the what they missed. Can you say “log jam”? The rest of the Institute is fairly easily accessible, with a few tricky places. As I said, my chief difficulty has to do with the eye level of art and the accompanying signage. This seems to be a universal problem, which could be easily remedied if the curator(s) borrowed a wheelchair from the concierge desk and travel the exhibition or galleries before deciding final placements. 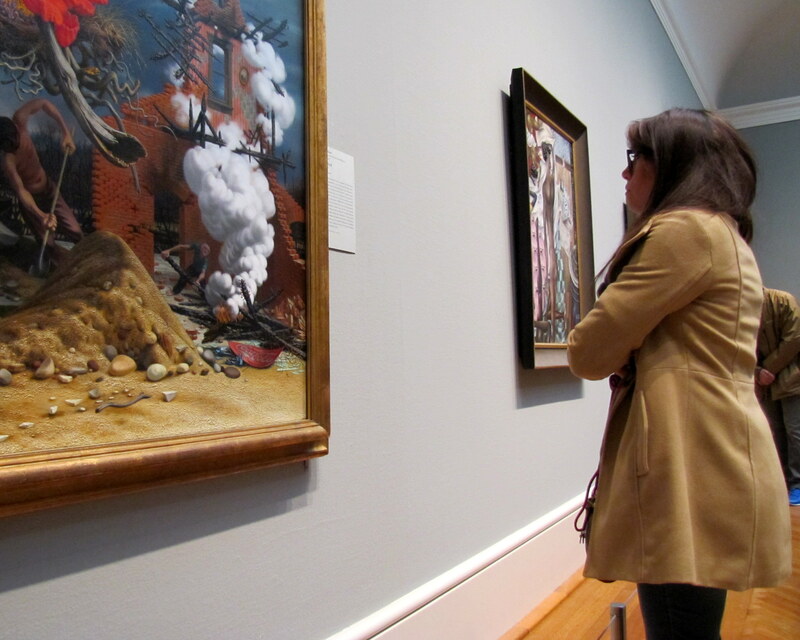 Look at it from a different point of view and make art truly accessible to all. Accessibility often has a few parts that don’t work – rendering the rest of the good parts useless. When these things happen, and you write about them, please send the offenders a copy. Sometimes they mean well, and sometimes they are just clueless, but that guard that cleared a path so you could leave thought he was helping – and was definitely not. Tell them that if they’re going to hand their paintings that high, they need either a wide raised path next to the wall or a couple of high wheelchairs. You paid – you deserve to be able to see.